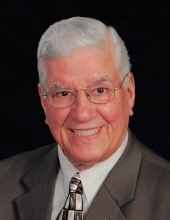 George J. Oreskovich, 89, of Oconee, passed away on Wednesday, November 28, 2018 in St. John’s Hospital, Springfield. He was born February 14, 1929 in Chicago to the late Jacob & Anna (Karjolich) Oreskovich. George worked at the Chicago Tribune as a pressman and later moved to Oconee in 1971 and continued his employment at the State Journal Register until his retirement. A faithful member of the First Baptist Church in Pana, he served as a deacon and usher for many years. He was a devoted volunteer at the Oconee Baptist Church Food Pantry. George married JoAnn Hinton on July 2, 1949 in Chicago and they were married for 65 years before her passing on September 7, 2014. George is survived by his sons: Rex Neal (Barbara) Oreskovich, Oconee, IL and George Austin (Carole) Oreskovich, Cary, IL; grandchildren: Jordan (Michael) Devine, Cary, IL; Kenneth (Colleen) Oreskovich, Gurnee, IL; Jason (Kim) Oreskovich, Kaneohe, Hawaii; 10 great grandchildren & 2 great-great grandchildren; and brother, Robert (Levonne) Oreskovich. In addition to his parents and wife, he was preceded in death by a grandson, Jacob “Joe” Oreskovich. Cremation rites will be accorded. Family members will gather at the homestead for a celebration of George’s life at a later date. A graveside inurnment service with the family will also be at a later date. In lieu of flowers, memorials in George’s honor may be made to Faith Bible Christian Academy or Oconee Food Pantry. "Email Address" would like to share the life celebration of George J. Oreskovich. Click on the "link" to go to share a favorite memory or leave a condolence message for the family.